A one-page business plan is a quick framework which aim is to answer a few of the critical questions if you want to get started with your business model. In short, that is the fastest and most effective ways to get your business started with the least amount of time invested. But is the one-page business plan a one-size-fits-all? Why use a one-page business plan? One of the issues of traditional business planning is about its complexity, which makes it hard to recognize its value. Indeed, a business plan should be a way to allow you to take action. The main issue with traditional business planning though is that rather than make it easier to take actions, it makes it harder. Indeed, often too much planning can induce the so-called analysis paralysis. A scenario in which drawing a massive plan becomes an excuse not to act. Instead, a one-page business plan is just the opposite. That is an exercise which aim is to draw in a page all the necessary elements your business model needs to get going — nothing more, nothing less. It is vital to understand when it makes sense to use a traditional business plan instead. Is the one-page business plan better than a conventional business plan? It is important to remark that there isn’t the best way to draw a business plan. Between a traditional and one-page business plan, we can’t say that one is better than the other in all the situations. They have different aims. The traditional business plan is extremely well suited for someone that is starting up a business that needs financing. The one-page business plan instead is tailored for someone that needs the necessary input to get the business started. Therefore, if you will need other investors to chip into your business, a one-page business plan won’t do. Especially if you go through a more traditional way to get the financing, you will need a structured business plan. On the other hand, if you need to understand whether your idea is actionable, you’re good with a one-page business plan! Thus, we need to draw a line between venture capital vs. bootstrapped. In the business world, there are different school of thoughts about what’s the best way to launch, run and grow a startup. It all depends on how you see the business world but also how the market is looking like in a particular historic context. For instance, in a situation where venture capital firms have massive resources and the economy, in general, is in good health, it might be easier for startups to raise capital. In that context, as an entrepreneur, it might make sense to ask for financing for your ventures. 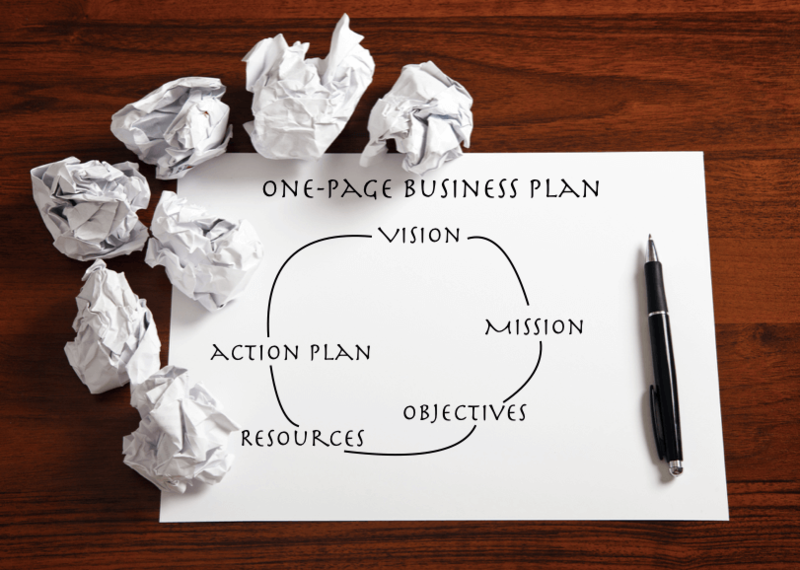 Therefore, a traditional business plan will help you go through that process. Take the opposite scenario, where funding is scarce, and resources are not easy to find on the market. In that scenario, the so-called bootstrapped mode, or you grow your business it might make more sense. Thus, a one-page business model will do! Once again, there isn’t the best way to do something. But instead, the way that suits you best, based on the context and how you believe business should work. For instance, if you don’t want the interference of other people telling you how to run, and grow your business, venture capital is not for you and a one-page business plan is the best tool you can use for clarity of mind. In the scenario, where you instead want to have a group of people supporting the growth of your business, and you’re also ready to take those interferences then a tradition business plan is the tool for you. None will back you up without a proper business plan with a three to five years projections. Another critical distinction between traditional business planning vs. the one-page business planning is the role of assumptions. When you draw a traditional business plan, there are many assumptions on which the business plan is based on. However, one of the premises of the lean startup is just the opposite. You need to get outside and test those assumptions quickly. Indeed, with the one-page business plan, you do just the opposite. Get to act as promptly as possible to check the assumptions you have about your business. The one-page business plan will be changed over and over again in the course of bootstrapping your business until you’ll have found the market fit and get to the 10x phase of growth. What parts should you take into account for the one-page business plan? Did I identify a problem that other people are experiencing? Is this problem experienced by enough people to justify a business? What solution can I bring to those people? Would people be willing to pay to get that problem solved? Would I make enough margin to have a viable business? Why would those people pick my solution? Do I need a team to deliver this solution? Do I need money or can I bootstrap it? One of the primary pitfalls of a business plan is usually too much planning and fancy numbers and no vision at all. Indeed, one of the key ingredients to be able to achieve massive results is a bold vision. The bold vision doesn’t mean you have to start a business to leave a legacy behind. Instead, that can also be a vision to dominate the market in a specific niche. The vision is about what you want your business to become when it grows up; how it will need to be. Once you have that you need to set a mission statement, the mission statement is actionable, and it starts from the vision, but it sets it in motion in the here and now. Within your mission, you’ll need to set a few key objectives you want to achieve. You don’t need a list of dozens of items. A list of the first few objectives and steps would do. What do you need to achieve those objectives? How much financial resources? Do you need a team? Do you need tools? List them up to understand what resources they require. With a vision, a mission statement and the objectives in place, that is when you need an action plan. A set of things to do in the short-term to achieve those objectives you prefigured.